The Prime Minister said India is urbanizing rapidly, and he sees this not as a challenge but as an opportunity for economic development. The Prime Minister, Narendra Modi, today outlined a vision for solid waste management and waste water management in 500 urban centres across India, through the PPP model. He said this would enable cleanliness in towns and cities, while facilitating ample water supply for agriculture to the nearby rural hinterland. 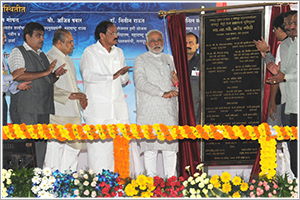 The Prime Minister was addressing a gathering in Nagpur after laying the foundation stone for Nagpur metro and Pardi grade separator and flyover on NH-6. The Prime Minister said that it should be a matter of concern for every Indian that we have got left behind in the quest for development compared to many other nations. He said every Indian should resolve that the country develops - this is a part of national character, the Prime Minister added. The Prime Minister also spoke strongly against corruption, and said he has resolved to curb it. The Prime Minister referred to Mahatma Gandhi`s commitment for cleanliness. He said keeping a city clean was the responsibility of its citizens. He exhorted the people of Nagpur to work towards a clean city. The Governor of Maharashtra Shri K. Sankaranarayanan, Minister for Urban Development Shri Venkaiah Naidu, Minister for Road Transport and Highways Shri Nitin Gadkari, and MoS(I/c) for Power Shri Piyush Goyal were present on the occasion.